Runs for Cookies: Buttercream frosting, oh my! Oh, and I probably should have mentioned that I HATE pedicures! That's why I've been procrastinating. I get grossed out by the thought of other people's feet in the little tub, and germs, and all that. Also, when they scrub your feet to exfoliate them? It's AWFUL--I hate even thinking about it. It's like fingernails on a blackboard to me! So I do my own toenails, but I haven't been able to after my surgery (it's hard to bend over that far for that long). I'll try and do it this week. I just got home from my aunt's house. She invites us over every year in December to decorate Christmas cookies. She makes a ton of cut-out cookies and bakes them, and then the kids (including her grandkids) go to town decorating with frosting and tons of sprinkles. Buttercream frosting is one of my top three biggest weaknesses (the other two being cookies and ice cream... and since this is hypothetical, we'll throw chocolate in there too. Oh, and marshmallow fluff). My aunt also made chili for dinner, and homemade macaroni and cheese. I decided to have a little of each, and mixed them together--it was delicious! There was a lot of other food, but nothing that was calling out to me like the desserts. Brownies with frosting, cupcakes with frosting, and cookies with frosting... it was like buttercream heaven! I decided not to eat any dessert while I was there, but I chose what I wanted most (a cupcake) and brought it home with me to eat for my treat tonight. I'm looking forward to it! I went for another three-mile run today. It was raining outside, so I decided to do the dreadmill. I put on my shorts and sports bra, and then thought about how much I used to love running in the rain. So I changed into my pants and a sweatshirt, put on a warm headband and some gloves, and did the run outside in the rain. It was fantastic! Even going slow and easy, I felt pretty sore at first. My inner thighs and hips are still sore from the run I did on Sunday, but I knew that was just "normal" soreness, so I pushed through it. But I was very careful because of my abs. After running, I felt really good. I noticed that my breathing wasn't as labored as it was during my first couple post-op runs (but that could just be because I was going slower). A few people asked me about running faster. While I'm certainly no expert, I did start out extremely slowly while running and then got a lot faster. There are lots of different ways to do it--the most popular being a speedwork run once a week. You can do that with interval training--run slowly, then run really fast, and repeat. I did this on the dreadmill because it was easy to keep a consistent pace. You could also do a tempo run, which is a "comfortably hard" pace. Go faster than you normally run, but not so fast that you feel like you're going to puke. Just run hard enough that you wish you could go slower, but you could still push through and keep going. When I was a beginner, I didn't know about intervals or tempo runs... I just made goals and worked toward them each time I ran. For example, my first goal was to run 12 minute miles (for 3 miles total). Once I met that goal, I started pushing for 11:30 miles, then 11:00. A BIG goal was to get under a 10:00 mile, and then a sub-30:00 5k. I would run 3 miles, 3 times per week--trying to finish a little faster each time. That worked really well for me, actually. I increased my speed significantly doing it that way. This past summer, I focused on doing "real" speedwork (intervals and tempo runs) to try and PR a 10k race. It didn't help at all--and I didn't get my PR :( I think next time I'll just do my own thing again. It's okay to break the rules and figure out what works for you! Gonna enjoy my cupcake now! Congrats on the sub-30 5k! I finally ran my first sub-30 a few days ago ... and I definitely took a picture of my Garmin, too. :) Enjoy the cupcake!!! Oh sorry! PR means "personal record"--I wanted to beat my best 10k race time. Question: Do you buy cinnamon almonds, or make your own? I have never had them! If you buy, them, where/what brand? Thanks! Pedicures scare me. I don't mind my husband giving me a food massage, but no one is going to scrub my skin or cut my nails for me! Even when I could barely reach my toes at 255 lbs, I still did my own toenails. Having said that, I *did* get one of those fish pedicures when Jason and I were in Baltimore last May. That was fantastic. The little fish nibbling my feet just felt like the sort of bubbles that rub over your feet in one of those spa-bath things. I'm not sure it really made my skin any smoother, but it was fun! I love getting pedicures, it's my one regular indulgence in the summer. In winter I dont bother, no-one sees my feet and I dont care if they look terrible. I love the feel of having them scrubbed, they are scrupulously clean where I go and wear gloves and masks and dispose of any blades as soon as they're done. I had my toenails painted black this summer, they looked amazing. Katie- Good job on the loss!!!!!! I am 2 pounds from my WW goal weight as of my weigh-in yesterday and I am hoping to make goal next week too!!!!! I can't think of a good reward that isn't $$$$$!!!! I just bought them at Kroger, and they are Cinnabon brand ;) They're roasted almonds with a hard crunchy cinnamon coating. So good, and not outrageous in calories (150 for a quarter cup, which is a decent serving size). It's warm enough for an outside run today and I STILL don't want to do it! I've been doing interval runs 2X/week. On Tuesday I alternated between 6.5 and 7.0 on the treadmill. I love the feeling of being completely shot when I hit the stop button! Katie dis you post your weigh in,, did I miss it somewhere ? Oi, you had to post this! 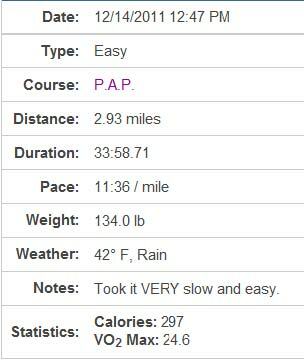 I've been thinking to myself that I needed to work on my speed, and I've known a few different techniques to do it... but I'm a lazy runner. I like jogging along and enjoying the scenery and such, but then at the same time I REALLY want to be fast. So, after reading this I'm motivated to get back to it (even though the lazy side of me really doesn't want to! ), speedwork here I come! Just wanted to say thanks for motivating me to get back into running...with the holidays, sick kids, lots of stuff to do, I've been a little stressed out. Seeing you start running again (especially after a major surgery) reminded me of how good it makes me feel! And congrats on being so close to goal - you're gonna be there very soon! You seem to be reading a lot of people's minds with this post! I just spent some time yesterday coming up with a running plan for the winter. I'm more interested in increasing my mileage than my speed, though. I'm super slow, but not really concerned about it at the moment. About the almonds...Blue Diamond makes some really good flavors, including chocolate (not so great) and butter toffee (to die for!). I buy them at Walmart. That cupcake looks REALLY yummy!!! Thank you, it was me that asked about food logs. It helps me a lot for some reason, to see what someone successful is doing.